The Oxford dictionary defines crisis as "a time of intense difficulty or danger" Such a time looms for the Internet, as the pool of IPv4 addresses, which has served for over 30 years, reaches the end. The crisis will be lack of preparation for its successor, IPv6. So when will IPv4 addresses no longer be available? It depends where you are, as detailed in "Addressing 2013 - That Was The Year That Was" by Geoff Huston. North America will exhaust its supply in early 2015, as this graph shows (North America, under the auspices of ARIN, is the purple line). This essentially means that North American service providers (e.g. 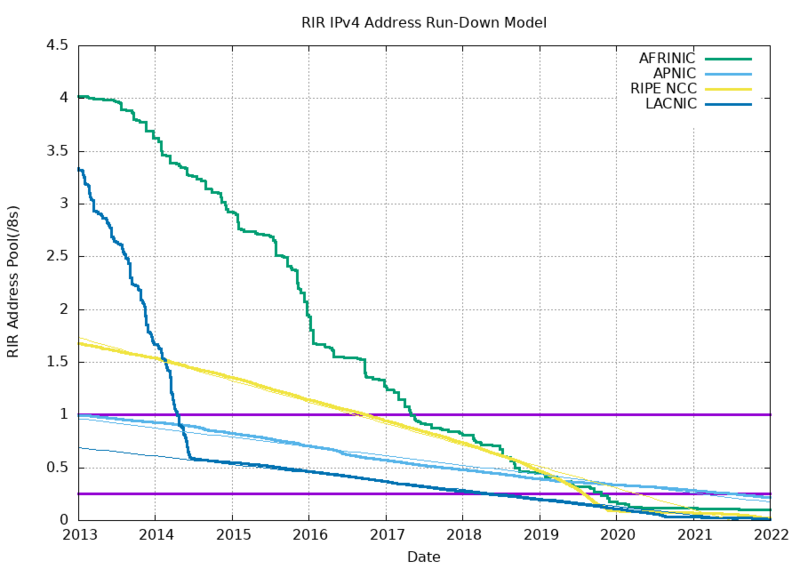 Verizon, T-Mobile) will get no further IPv4 addresses post 2015. They will still have internal IPv4 address supplies, however these are strictly finite. Notwithstanding the looming IPv4 address shortage, the Internet will expand rapidly. Cisco predicts the number of IP connected devices to grow from 1.6 billion in 2012 to 8 billion in 2017. The addresses underpinning this growth will either be IPv6, or IPv4 ones greatly extended by a technique called "Carrier Grade NAT", which essentially shares a single IPv4 address amongst many subscribers. While Carrier Grade NAT provides an interim solution, it has major security and scalability issues, as outlined in this APNIC report. In particular, Carrier Grade NAT may restrict the number of Ports (applications) per subscriber, a potentially serious service availability limitation. While Carrier Grade NAT may extend the Internet, it may also break it. Hence IPv6 must be deployed. In short, if your network has no IPv6 migration plan, then you have a crisis. Perhaps not today. Which indeed underpins the IPv6 migration problem, the apparent lack of an immediate imperative. However, networks which are not IPv6 ready will see, and be seen by increasingly less of the Internet as IPv6 expands. Not really. IPv6 migration will require a significant budget, senior executives must see the need and sign off on it. This entails an IPv6 education program, led by CIOs. Moreover, government policy professionals in IT areas must be IPv6 aware, given potentially serious implications for Internet stability during the migration, expected to last a decade at least. A massive development effort averted the Y2K crisis in 2000. A similar effort is needed for IPv6 migration. However, unlike Y2K, there isn't a single date by which IPv6 must be implemented. Instead, unless managed properly, IPv6 issues may steadily undermine Internet stability, year by year, with potentially unthinkable consequences. What is IPv6 and why should I be concerned about it?